Some of the best magnet uses we've seen are also the most simple. 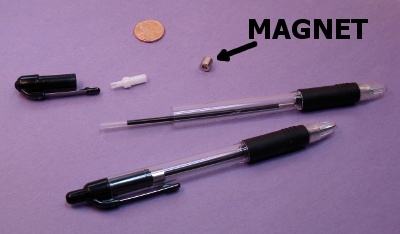 This month's contest winner puts small magnets inside a pen. The magnetic pen sticks to your fridge door and doesn't get lost. Read more to find out how, and learn a little bit about diametrically magnetized magnets along the way. Thanks to Jeanette A. from Maine for the great idea! A single R424DIA magnet is inserted into a pen, with the inkwell running through the middle of the magnet. With the pen re-assembled, it sticks to most steel surfaces. While one magnet is enough to hold it securely to the refrigerator door, also consider using two magnets for greater strength. In the example shown, an R424DIA magnet is used inside a Zebra Z-Grip pen. This pen is inexpensive and widely available. You could use a different pen, it just needs to be wide enough to fit the 1/4" diameter magnet inside. Simply disassemble the pen and slide one or two magnets onto the ink-well. Re-assemble with the magnet inside, and you're done! What does Diametrically Magnetized mean? Why use it here? K&J Magnetics offers two different magnets in this size, the R424 and the R424DIA. The former is axially magnetized, while the latter is diametrically magnetized. The north and south poles are oriented differently in these two magnets. See our Magnetization Direction page for visual examples of the ways typical magnet shapes can be magnetized. In this application, either magnet will attract towards the steel refrigrator. Because of the magnets orientation, however, the diametrically magnetized magnet is stronger. The magnet rotates inside the pen so that one of the poles pulls close to the steel. Some measurements we made show that using the diametrically magnetized ring provides about twice the pull strength. For those curious about pull force data, we took a few measurements that illustrate how these two different magnetization directions can perform. We conducted our Pull Force Case 1 test in two ways with these two magnets. In one, the flat, round face touches a steel plate. In the second, the curved face touches a steel plate. In all these tests, the magnets were touching the plate directly. Inside a pen, expect the pull forces to be lower since the magnet is separated from the steel plate by some distance. We receive many emails about hanging artwork with neodymium magnets. Magnets are no longer only for hanging kid's art on the refrigerator -- many artists are using neodymium magnets to mount artwork in galleries and museums. Though it's hard to judge art, this month's winner includes a great idea for an art project using magnets. The contest winner for November 2010 is Jim K. from Westborough, MA. We've heard about a number of great magnetic spice racks. Using neodymium magnets to mount spice containers is becoming increasingly popular. You can find many DIY examples out there with a quick search (like this, this or this). What sets this one apart is it's hands-free design.